What should I do if I have received an alert? If you have received an alert you should first check if the alert received is in relation to a credit application that you may have recently submitted or if it relates to an existing facility in your name. If it isn’t, it could be that someone else is trying to apply for credit using your identity details. In this case you should inform the credit provider immediately. For other alerts you may wish to get an updated copy of your credit report to check the details. Find out how lenders view your business and protect against fraud. Pay your loans and bills on time - Consider setting up direct debits and schedule loan repayments for your pay day. Keep track of your credit commitments - Do your homework before applying for credit and keep track of your credit commitments. Making a number of applications within a short space of time will be recorded on your file and is not always looked upon positively by lenders, as it may be an indicator that you're in credit stress. If you move house, notify lenders - advise lenders, phone and utility providers of your new address so they can re-direct bills to your new address. If you don't pay these bills, a credit infringement or overdue debt could be listed on your credit report. If you are having trouble meeting repayments - talk to your credit provider who may assist. Keep track of your credit record - proactively manage your personal credit report by regularly checking your Equifax credit report and Equifax Score. You can even monitor changes through credit alerts. Please note your Equifax Score is available via our other Equifax personal credit and identity monitoring services. Find out more here. You can get also get your free Equifax credit report. What goes into a personal credit report? Do you know what your credit report contains? 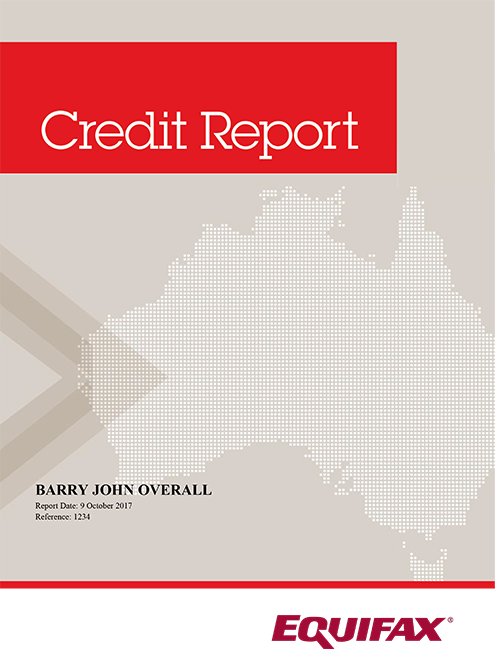 Here we outline what is included in a personal credit report.